Grab the opportunity to add some math to your Easter fun with this sorting, charting and counting math activity sheet for kids ages 3-7 (depending on the child). Take a handful of jelly beans and encourage kids to sort them by color then use our worksheet to chart their findings and count the total number of each jelly bean color. 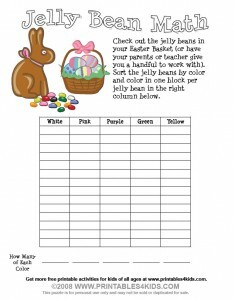 Click on the image above to view and print the jelly bean math worksheet full size or download the Easter Jelly Bean Math Worksheet as a PDF file. I just LOVE these! I have featured your post in my Easter Inspirations as one of my favorite ideas on the web. Thanks so much for sharing!